DRAGOBRATH is a black metal band from the capital of Western Ukraine - ancient city of Lviv. The name of the band comes from the name of the old and famous Carpathian mountain - Dragobrath. It was chosen to underline the connection of band’s music conception with old land of Ukrainian Carpathians. 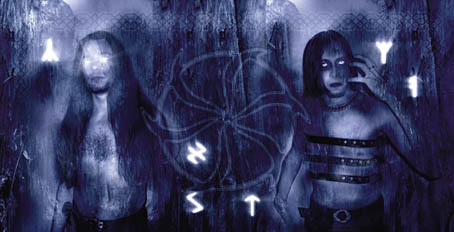 The style of the band is possible to describe as a black metal mixture made of atmospheric, aggressive and melodic riffs. For DRAGOBRATH it all started in 2004, when the instrumental part of the musical material was recorded by Synevir. He was then searching for the man to perform vocals for this stuff. Soon enough he had a chat with his old friend Krukh, who himself is a well known person in the underground movement of Lviv and happened to be a vocalist. The decision was made than - and Krukh became the second member of the band. As for the bands members Synevir and Krukh they also participated or still take part in other Lviv bands. Synevir played in doom metal legend of Western Ukraine APOSTATE and still plays in CAPITOLLIUM (sympho black). Krukh in his musical activity is closely connected with CRANIUM (grindcore) and DOGMA (melodic/techno death). At the year of 2005 the work on the first album was finished and it was called “Scripture of the Woods”. The work contains 8 songs composed by DRAGOBRATH and a DARKTHRONE classics cover Transylvanian Hunger". From the lyrical point of view eight track of the album display the slow anamorphosis of the present existing reality into the old and forgotten pagan times. The aim of the musicians was to perform something unusual. Unusual in the sense of music itself and lyrics. Music was meant to combine speed and aggression with comparatively slow and melodic atmospheric parts. And of course the idea also was to do aggressive black, because nowadays many bands started playing commercially oriented some MTV black. So the recorded material was meant to be as raw as possible, but nevertheless readable.